I would love to know more of the specifics on how you use these. * Build the musical alphabet, forwards, backwards, and starting on various letters. *Practice organizing letters into skips. *Practice intervals by picking a block, then finding a block a fourth higher, fifth lower, and so on. *Building triads, and changing them from major to minor, then diminished and augmented. I’m sure there are many more things, but those are some I do often with the students. I really like this idea! I was surprised that even I could make them (sometimes, I am “creatively challenged”. I was wondering one thing, though, and that is how can I protect them? I teach group lessons and sometimes the kids can be rough on things. They obviously can’t be laminated…..is there anything out there that they could be “coated” with that would extend their life time? I place sections of cardboard on the sides that will face in and that lends support to the overall structure of the cube. I think you can laminate them…just use a craft knife to score the fold lines before you fold them and you shouldn’t have a problem. I like the idea of putting a piece of cardboard on the inside…and with lamination they should be pretty sturdy. I love your ideas and resources. Thank you for sharing. 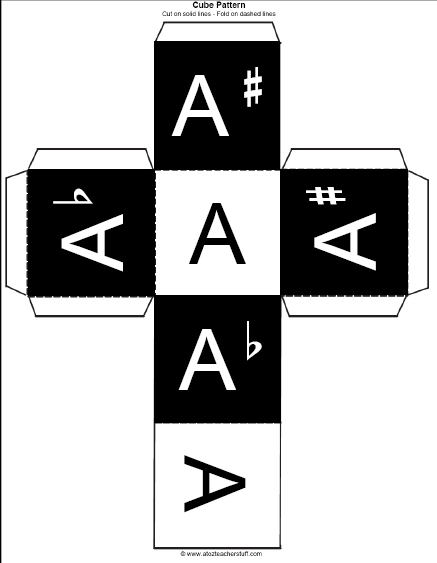 As I was building different qualities of triads, I realized that we need some double flats (Abb, Bbb, Dbb, Ebb, Gbb ) and double sharps (Cx, Fx, Gx) to build the diminished and augmented qualities. Can you add those to your existing blocks? I just wrote on mine because they are white keys, but it would be nice to have them printed. I had to make two separate blocks for G.
Also, I made mine into stickers and just put them on blank dice so they would be sturdy. Wow, this is a great idea, but im teaching an adult groupguitar and bass basics, do you have anything a little more, err… practical?